If you live in North America, you’re probably experiencing record breaking cold temperatures this year. Related to that, you’re probably also seeing shocking energy bills. Lack of insulation is the main cause of high energy usage in homes and buildings. Spaces that don’t have insulation are the main trouble spots for loss of heat in the winter and also gain of heat in the summer. So do you hire an insulation contractor and shell out thousands of dollars? A good low-cost solution to insulating your home is via Do-It-Yourself Closed Cell Spray Foam Kits. 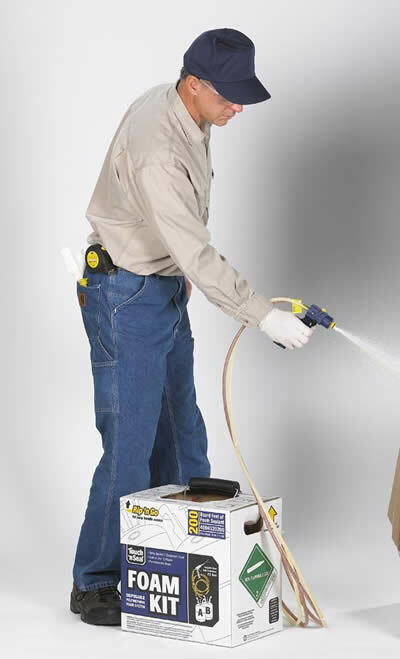 A spray foam kit comes with everything you need to insulate those trouble spots in your home or building. It contains a dispensing gun hose assembly as well as cones and nozzles to provide more control over the way it is sprayed. There are 2 types of spray foam available: closed cell and open cell. In closed cell foam, the cells of the chemical are closed and hence have a rigid and denser structure. Open cell foam by contrast has a more open cell structure and therefore has a more sponge like texture. As a result, closed cell foam has a higher R value than open cell foam. Another difference is closed cell foam acts as an air and water vapor barrier, whilst open cell foam is only suitable as an air barrier. Therefore, open cell foam is not recommended for use outside. Closed Cell Spray Foam is very useful for insulating places such as: garages, rafters, walls and floors as well as roofing and outdoor projects. DIY Spray Foam Insulation comes variety of sizes such as 600, 200 and 15 Board Foot. Board foot just means that one 600 board foot kit will cover a 600 square foot area with 1 inch of foam. So whether you need to insulate a whole wall in your basement, or you just need to insulate a small area, there is spray foam size for your need. Another advantage of closed cell foam is that it comes in a Fire Retardant formula. This is useful because some city codes require insulation to have fire retardant formulas. So if you’re looking for a low cost, do it yourself solution for insulating those cold areas of your home, Closed Cell Spray Foam is a great option. And if you’re unsure if you’re up to the task, there are plenty of instructional guides and videos available to help you. ← What is DLC Approval and is it Important?